It’s safe to say that I have been obsessing a bit about appliances over the past few months. Planning meticulously, I leapt at an un-announced sale and walked away with some killer deals on a very nice set of machines. Our objective here was to balance the nicest models we could manage without going to custom sizes (or pricing). Thanks to good planning and frugal decisions elsewhere, we made room in the budget for several upgrades we hadn’t previously anticipated. In this post, I’ll cover each of the appliances we ordered. Once we are moved in, I will provide in-depth reviews of each appliance. This 500 Series Bosch features quiet operation (44dBA), no protruding handle, and an easily removable 3rd rack. 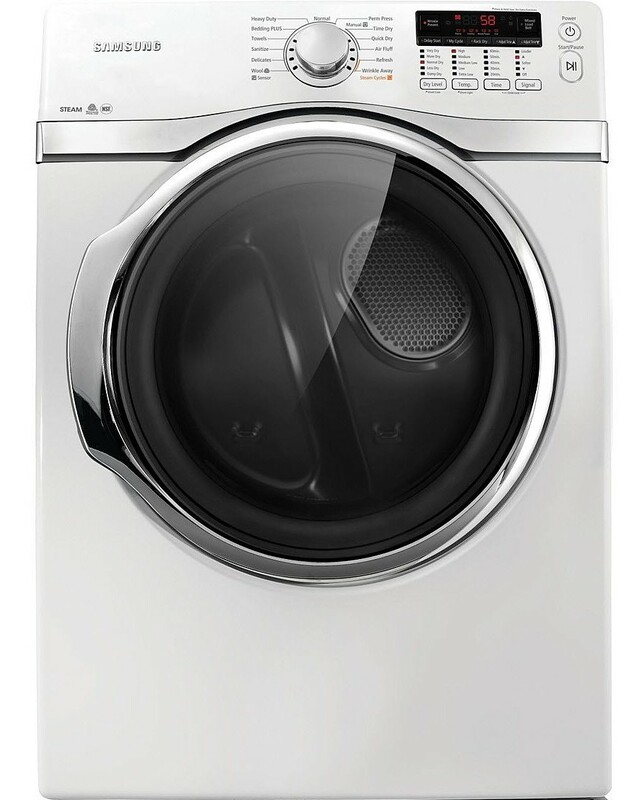 Bosch is widely reputed to be one of the best washer manufacturers. They take a more utilitarian approach to design, and the results are fewer wiggly prongs or fiddly toggles and flaps that never get used. Dishwashers are perhaps the most compact segment of the appliance market, with very few models costing more than $2,000 and most retailing in the $400-$900 range. With so many competing models in such a tight dollar range, the consumer can’t rely on price signals and is left weeding through a large selection of non-descript or proprietary features such as “Turbo jet clean”, “Pro-clean racks”, and “hybrid” design. That made this the most difficult appliance for me to pick out. There were a few stand-out features that caught my eye such as Bosch’s TimeLight, Kitchenaid’s UltraHandle, and Kenmore’s one-hand rack adjuster, but each of these came with a hefty price premium. In the end, I focused on 3-rack dishwashers with steam, top reviews, low dBA, and good styling. I found the sanitize feature quite appealing for several reasons. There are times you’d like to steam dishes either to sanitize or loosen stubborn crusties. Serving a fancy meal? Steam your clean plates and pull them out just before serving to provide a nice hot plate experience. The embedded handle is a big boon as well. Our last dishwasher was famous for catching clothes and sleeves of folks walking by. We lost several pieces of clothing to its barbell-style handle. Even though we planned our new kitchen to have plenty of walking room all around the island, I’d like to eliminate the possibility of handle snags. 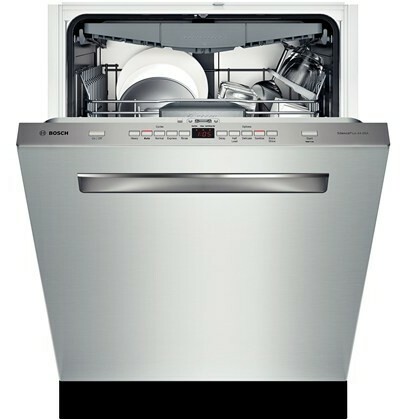 By the way, a hybrid dishwasher is a euphemism for a tub that is plastic on the sides and metal on the bottom. This four-door line of Sammy fridges is truly innovative. 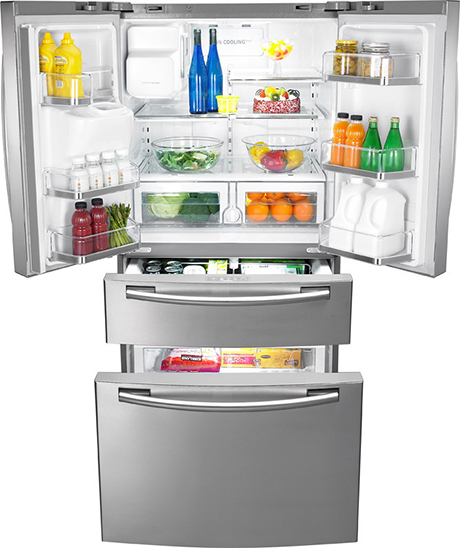 At 24 advertised cubic feet, it is among the largest capacity counter-depth fridges available today. The top two doors open to reveal a capacious fridge and the bottom drawer is a modest freezer. The real kicker comes in the upper drawer which can pinch hit as either fridge or freezer. Since we mostly use our freezer for Costco-run stoarge, our flex-drawer will be in fridge mode most of the time and we will supplement our freezer capacity with a deep freezer in the garage. One of the points I am critical of with refrigerators is the control panel and in-door dispenser. With young kids, I didn’t want them to have to dig through a freezer for ice or open the fridge for water. For my own sanity, I didn’t want a goofy animated screen on the fridge or some convoluted menu (some fridge makers perplexingly require several button presses to activate cold water or switch ice type). I also preferred simple ice/water dispensing operation. This Samsung line offers a dual-paddle system with water and/or ice available with a one-handed cup press. Fridges are one of two places most likely to drive your appliance collection over budget. Because I found savings elsewhere, I felt comfortable splashing out a bit and getting the finest model I could get my hands on before the prices made a 3x jump to the “custom” lines. Maybe we can find budget and room for a wider built-in fridge when we do a remodel several years down the road, but I suspect this fridge will serve us quite well in the meantime. 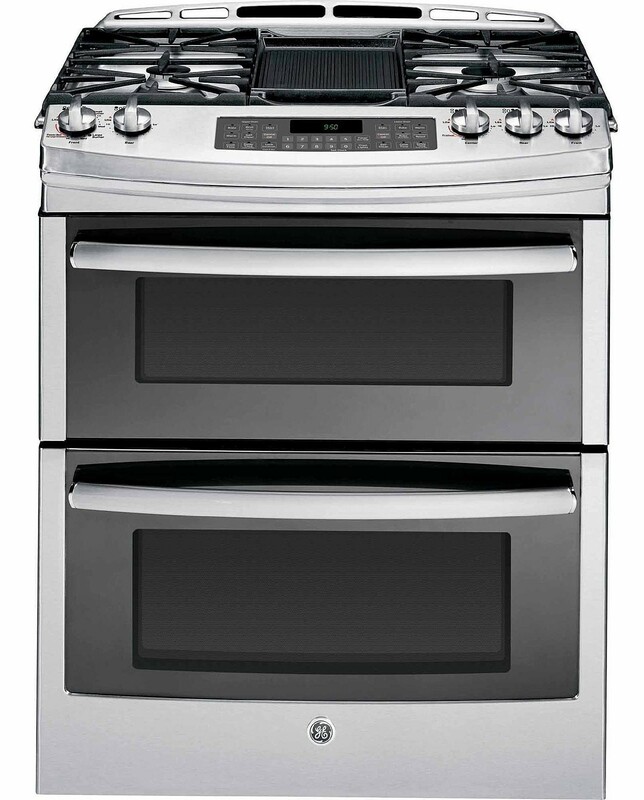 This gas powered five-burner double oven means business. It dispenses with the pot/pan drawer in favor of two independently operable convection ovens. I’m told the bottom oven even has a built-in temperature probe for perfect roasting and baking. With a wider top due to slide-in styling and no control panel on the back, there is much more usable cooking space. The top burners have everything you might need: a gentle simmer burner, a centerline griddle/grill, and a monster 20,000 BTU power boil burner. Brand new for September 2013, this model isn’t even in showrooms as of this writing. This model supersedes the GE CGS990SETSS, bringing great new features such as capacitive touch controls for both ovens, an upward-angled control interface (safer for kids and adults passing by), and a wider cook top thanks to the slide-in finish. It has the more neutral styling of the Profile series as opposed to the decidedly more blocky and masculine Cafe line. Best of all, these features all come with a lower MSRP. Go GE! The cooking space is the other place where prices can get out of hand quickly*. I first spied dual-ranges several years ago but thought them over the top. Since then, I’ve kept a mental tally of the number of times I’ve had a baking conflict where I wanted to warm or bake one item at a different temperature from another. As it turns out, this is a regular occurrence while entertaining, so I see this as a beautiful addition that will allow me to spend more quality time with my friends and family and less time batching items through an oven. * If you need further proof that ovens are the best place to lose your head and blow your budget, check out the AGA cooker which can easily run over $20,000 and stays on at full baking temperature 24/7, consuming more than 38 times the energy of a typical gas oven. This beautiful hood sports a classic style with modern refinements. Theater style dimming halogen lights, digital run timer, 0.3 to 5.0 sones operating range with up to 630 CFM exhausting power, and an innovative night light feature make this a premium-level appliance at a relative bargain price. 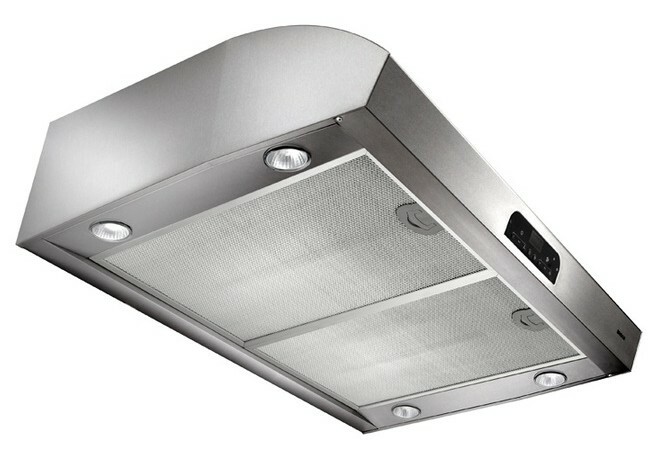 When I thought “quality kitchen vent hood,” Broan wasn’t the first brand to spring to mind. Since they service such a wide section of the market, I’d become all too familiar with the cheap-o models that you see in apartments and budget kitchenettes. The Broan Evolution series changed my mind by showing that you don’t need to sell a kidney to get high-end features. The first thing that caught my eye on this fan was the lights that fade in and out. The LCD display is unobtrusive yet very feature rich. A hood with a countdown timer was important to me, as I want to be able to finish cooking and leave the room while the fan runs for another 10 minutes to finish its job. A kitchen pro insisted that we would appreciate having a 36″ fan installed above a 30″ oven. It would maintain symmetry and yet provide a wider basin in which to capture fumes. Fans over 400 CFM are required by code (IRC) to have a make-up air damper installed somewhere in the house. We opted for the Broan MD6T. 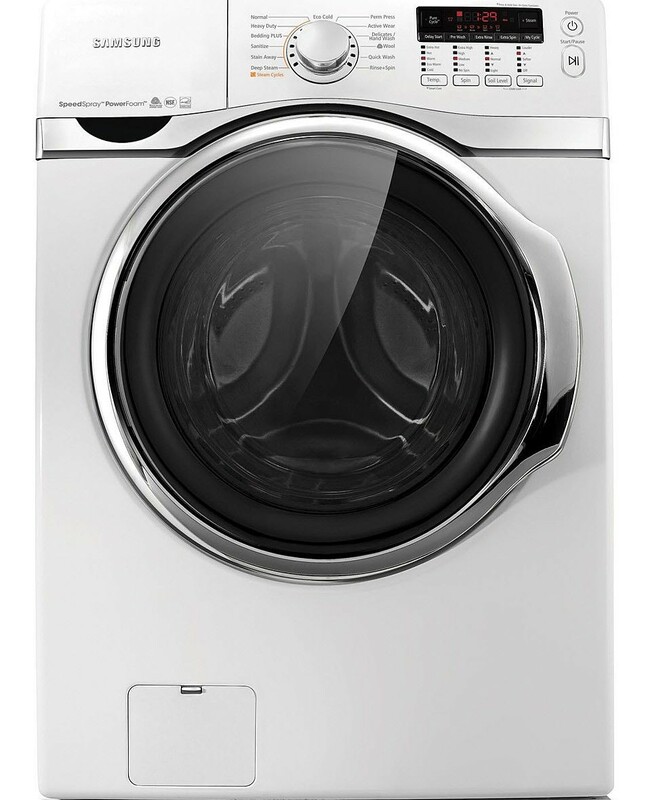 The 405 series of washer and dryer are an excellent balance of value and premium features. Steam treatments on both appliances offer stain lifting and rapid refresh cycles. Huge capacity, good user interfaces and Samsung’s VRT (Vibration Reduction Technology) round out a great offering. I should make it clear that I’ve been banned from the laundry room. After shrinking one too many important garments, I’ve been deemed a menace and a threat to anything bearing thread. With that in mind, I homed in on pairs of LG and Maytag appliances. Once my wife got to the showroom, she immediately dismissed my selections and rationale in favor of her much better informed wish list. I’m glad she came, because those silk tops wouldn’t have been the only thing in hot water if I had made the buy without consulting first. They offered them in gray, but that color cost an extra $100. Each. Neither one of us were impressed, so we went with the classic white look. I’m toying with the idea of recruiting an army of floor cleaning robots. We’ll have enough open floorspace that this might make sense. At the very least, it will provide hours of entertainment for the kids and cats, which is surely enough to justify the cost. I’ll be upgrading the disposal to an InSinkErator Evolution Excel at some point, but I’ll just stick it in myself later. We also need to find a decent deep freezer for the garage. I’d love to find a small (energy efficient) commercial freezer with a glass door so we can see all of the goodies within. This entry was posted in Construction and tagged appliances, furnishings. Bookmark the permalink. Can I come and play with your new toys when they are ready for use? They look fabulous! I definitely think I’ll need your help breaking this kitchen in!